That really describes the state of mind I was in after finishing all 30 of these swap cards! Purple is not a color I work with often - don't get me wrong, I love purple - but it's just one of those colors that doesn't get pulled out much on impulse for me. My actual inspiration for this card came from two sources. The first was the cover of a Ballard Designs catalog that my friend Lissa gave me last week. It had a black and white toile decor scheme with small pops of lavender. Very fresh and clean looking. My second inspiration came from a swap card I received from my friend Jaimie. She used Orchid Opulence which I hadn't used in FOREVER! It inspired me to get my very old pack of cardstock out and USE it! Thanks Jaimie! So, I started with a card base of Orchid Opulence folded to make a 4 1/4" by 5 1/2" card. The next layer is Elegant Eggplant trimmed at 3 7/8" x 5 1/8". This gave a greater variance so the Orchid color would be more prominent. Inspired by the clean look of the catalog cover, I used Whisper White for my top layer, stamping on a portion of it with the bold flowers from the Garden Greetings stamp set. The large flower is stamped in Orchid Opulence, the medium in Elegant Eggplant and the small in Basic Gray. Basic Black was too stark. When stamping, I masked off a portion of the cardstock with scrap paper so it would remain white. Another detail I added, which is impossible to see in this photo, is the embossed Polka Dots on the Whisper White layer. I used my new Big Shot Texturz Plates to create the embossing. All of the flowers received Purple Fine Cosmo Glitter for their centers and then both layers were mounted together with Elegant Eggplant Narrow Grosgrain wrapped around the stamped line. 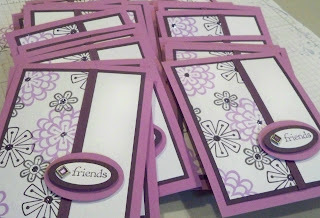 To create the greeting, I stamped "Friends" in Elegant Eggplant on Whisper White, then punched it out with my Small Oval Punch. This was mounted on a Large Oval Punch of Elegant Eggplant and a Square Rhinestone Ice Brad in PURPLE was added. Dimensionals were placed on the back of the greeting and it was mounted on yet another layer of Orchid Opulence punched out with my Wide Oval Punch. More Dimensionals were added and it was mounted to the card front. So, now all the swaps are in the mail, sending stamped happiness to my demonstrator friends across the US! I hope they like this card and I hope you do too. Maybe it's inspired you to get out a color you rarely work with and USE it! If so, send me a picture of your creation! I'd love to know how you are inspired! Beautiful card! I'm always looking for ways to use Orchid Opulence, so thanks! I read your blog via reader and the pictures don't pop up. Can you change your settings so that your photos pop up in reader? Great use of color! Can't wait to get one! Seriously... if i NEED to use orchard opulence... the thought of trying to figure out what to put it with makes me break out in hives! :) However, your card is STUNNING and I cant wait to receive one of these beauties in my mailbox. Whoa Girl! You rock! OMG!!! This is just beautiful and I too have a hard time using that color so thanks so much!! I can't wait to get mine in the mail too and of course all the others!! Beautiful, Robin! BooHoo....missed out on this one. But I can drool, right?!! I can't imagine that the others won't love it, too! CONGRATULATIONS, Robin! 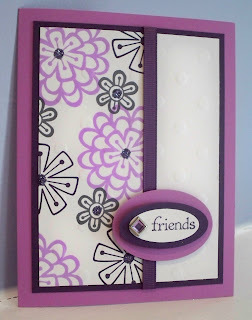 This card is being featured on Stampers' Showcase today (3/13....LUCKY Friday the 13th)!! Way to go....and much deserved! !